The site was discovered in the early nineteenth century by tin prospectors and the fougou was exposed in the eighteen sixties by the antiquarian William Copeland Borlase. The nine hut foundations were discovered and the fougou restored during extensive excavations of the site between 1964 and 1972. The excavations show that the site was a hive of constant activity from the Neolithic period right up until the late Roman period, when the village was abandoned. 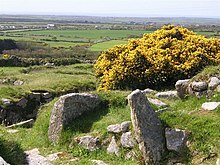 Carn Euny, which is located near Sancreed on the Penwith peninsula, can be accessed at any time free of charge. The earliest buildings at Carn Eunyprobably had earthen walls, these were replaced by wooden structures that werein turn replaced by stone roundhouses with thatch or sod roofs, and finally bythe Courtyard Houses. Dating from the Iron Age, Courtyard Houses are unique tothe SW peninsula, a compound is surrounded by a circular stone wall and stonebuildings are positioned around the inner circumference with doorways openinginto the central space. At Carn Euny, Courtyard House 1 has a special portal inthe outer wall leading to the subterranean fogou. It is important to note that when the firstpart of the fogou was built, it was the only stone structure at the site. Thissuggests that whatever the purpose of the fogou, it must have been ofoverwhelming importance to the community for them to expend so much of theirresources on its construction. The first stage of the fogou was thecircular chamber and its entrance passage to the south. 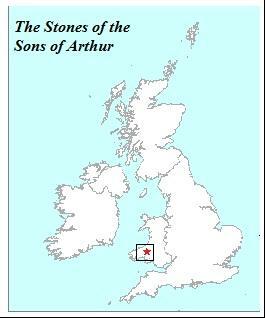 The dating of the phasesof construction can only be approximate, but this initial stage is thought tohave occurred about 500BC. 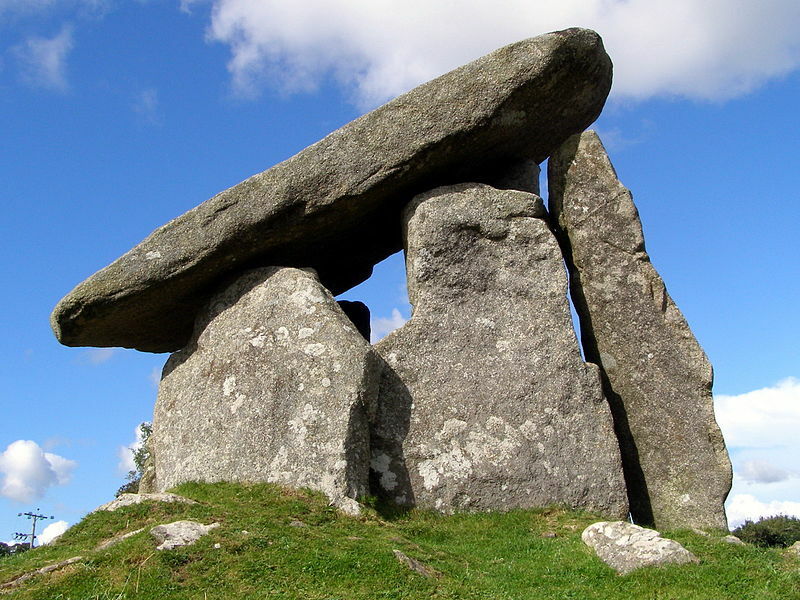 The next stage was the construction of the fogoutunnel, thought to have commenced around 400BC. This new section runs off fromthe original entrance passage which was blocked, access to the complex was nowvia a small creepway passage at the western end of the new tunnel. The finalphase of the fogou modification was during the construction of the CourtyardHouses around 50BC-100AD, the eastern end of the fogou was opened up and apathway built to connect it with the compound of Courtyard House 1. 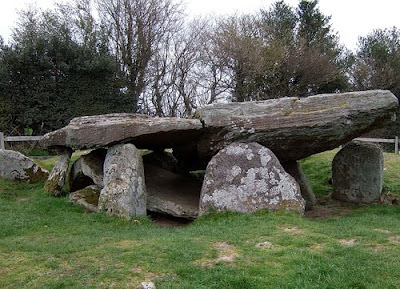 Today, the roofed section of the fogou isabout 12.5m long and about 2m in height and width, the dry stone walls taper intoward the top, thus reducing the span of the roofslabs. The tunnel is now openat both ends, but the original northern creepway entrance has been blocked by agrille. The circular chamber is about 4.5m in diameter and is of corbelledconstruction, forming a beehive shape, it now has a modern metal roof. A niche,resembling a modern fireplace, has been built into the wall of the chamberopposite the entrance, its purpose is unknown. The original function of fogous remains amystery, although there are certain features that occur in many examples, thereis little to suggest a probable use. 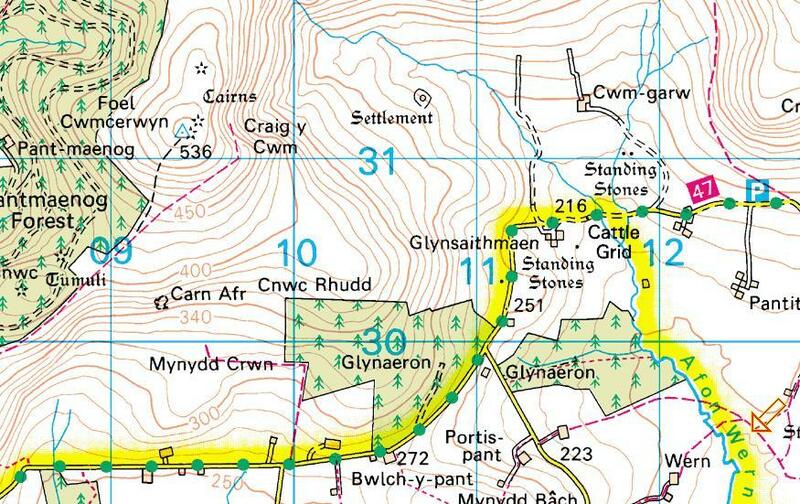 At Carn Euny, the entrance creepway portallimits the size of objects entering by its 1m x 0.5m dimensions, why then builda long passage of such large section? Similar restrictions would have occurredat the Boleigh and Halligyyefogous with their capacious main passages and small entrance and intermediateportals. These enigmatic underground chambers, thousands of years old, have apowerful atmosphere even today, and as you stand in their silent dark interiors,you cannot help but wonder if their secrets will ever be revealed. A dramatic Iron Age cliff fort on a south-pointing headland between Porthcurno and Penberth in Cornwall. The landward side is defended by three pairs of ramparts and ditches, and these are still impressive. 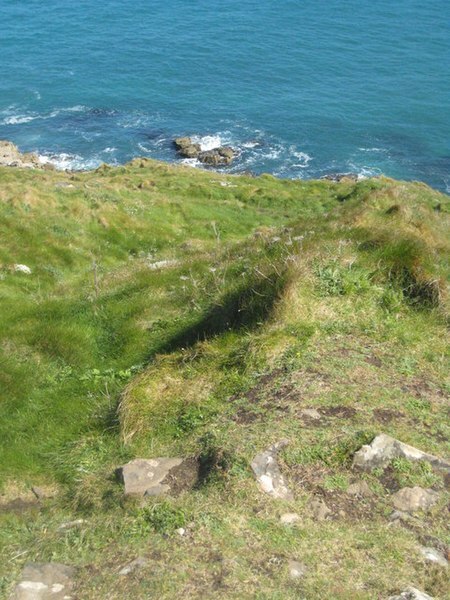 The headland has a very narrow neck, and this is defended by a ditch and stone wall. Nearby are traces of roundhouses. Coastal views from the cliff fort are outstanding. 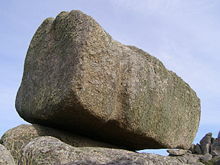 Most visitors to ths granite headland come to see the “Logan Rock”, an 80 tonne loganstone that was dislodged by a naval lieutenant in 1824 and subsequently replaced at great expense. Access There is a small “Pay and display” car park at Treen (SW395230) and a clearly signposted path south across arable fields to the headland. Alternatively approach along the coastal footpath from Penberth or Porthcurno. Exploring the tip of the promontory around the Logan Rock will involve steep climbing, and could be dangerous during windy/wet weather because it is so exposed. Note: Not to be confused with the similarly named Trereen Dinas cliff castle (near a different hamlet called Treen) on the northern coast of the Penwith peninsula near Zennor.